Well it was a good 4th of July weekend. Good as can be, really, and surely better than most. Full to the brim with good food, and good fellowship, and good times. Sadly, it’s come and gone now, like all holidays do, with a soft, pastel sun ebbing into a western sky. And as I watch it sink beyond yonder tree tops, with an icy beverage at hand, left leg crossed over right, I pause to rejoice for these long summer days that which are upon us. We are not worthy. As the temperatures rose to almost 88 degrees today, at last we see again what you good folk down in Ecuador and Texas and Florida experience on a daily basis. Sweat. Inconceivable tributaries of it, dribbling down spine and brow with no remorse nor good will for common man. It’s rather wretched, and that’s a polite metaphor. But after a while you learn to accept it. Because deep down you know the sweat means winter is displaced. And a winter gone means things can grow again. 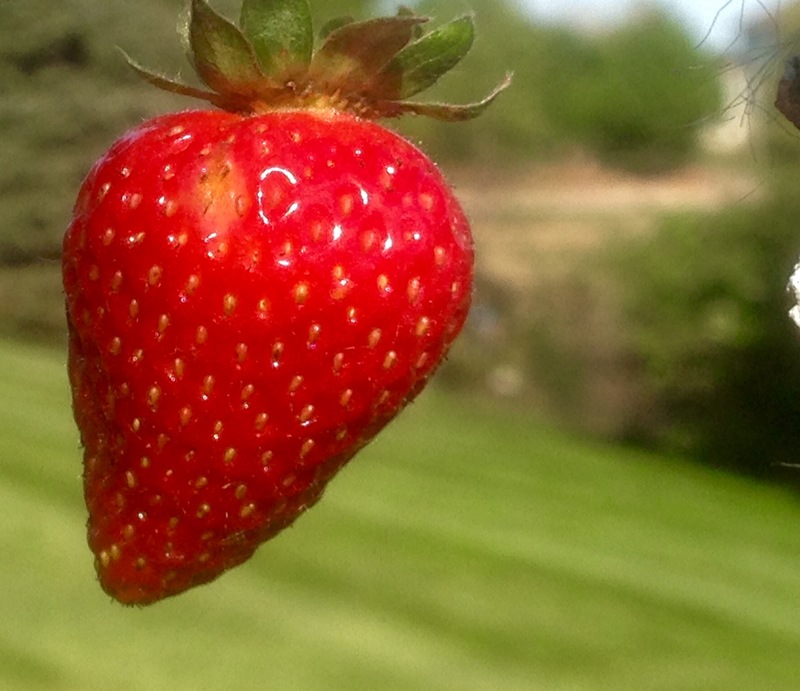 There is life in the good tidings of summer’s bosom. Things like the deliciousness found growing in the pit side garden. Spires of green onions proudly pitched. Pole beans reaching for more lattice. Lush, plump tomatoes and deep-red strawberries dangling in the evening sun. Glory! I must say, what a privilege it is to tarry in the garden here, whilst blue-tinted pillars of hickory smoke catch in a summer’s breeze. That’s about how supper went tonight. Pleasant. And man it was good too! And after I refill my cup, I’ll be back and tell you more about it and how it went and came be. I was given this spice gift a while back, and thought well enough of it to pass it along to you. 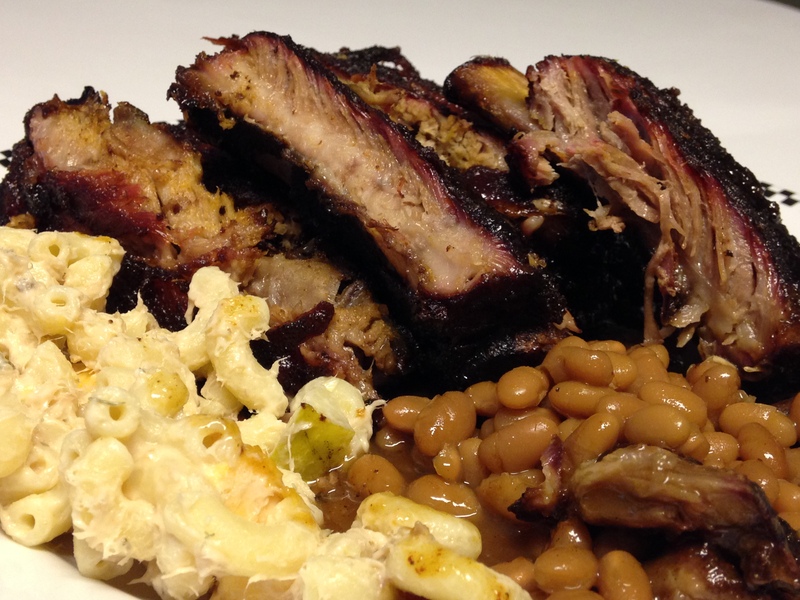 It’s a homemade affair, and makes a great gift for your resident pit master. If you go to their site, http://www.theyummylife.com, you can print up the label thing in the photo. And from your local grocer, you buy yourself the jar and all the spices and what not, and kabam! 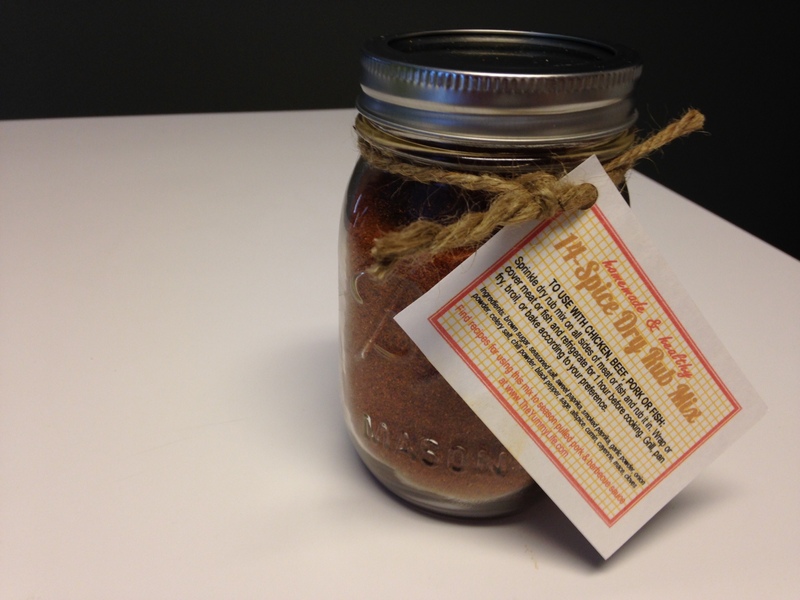 A very tasty spice rub to give to family and friends. Anyways, if you want the recipe, you’ll find the link to their site below. We tried it on pork ribs tonight, and I don’t need tell you, but will anyways, that victory was at hand! Now my elder brother, who sometimes is the focus of our grilling tome here, well let’s just say he’s come a long ways in the smokey arts. He’s got frozen hamburger patties and beef franks down pretty good. He’s not using green treated wood for smoke, and I don’t think he’s burned the chicken in some three months. He’s feeling rather endowed. So he mentioned the other day that the time had come, that he wished to try smoking pork ribs, and he wanted to know if it would be possible even, on his humble kettle grill. 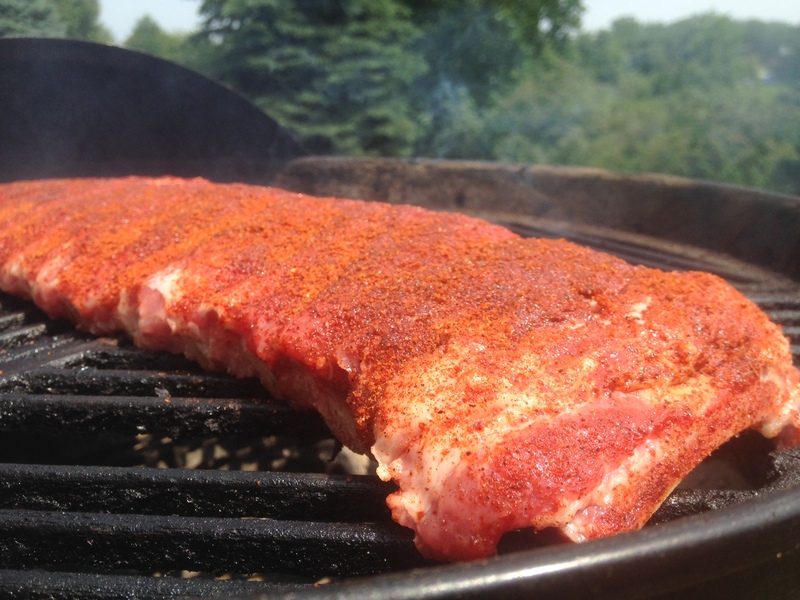 We occasionally get queried this – how to smoke ribs on a regular, old, back yard grill. Well, the Weber kettle is about as regular and back yard as it gets, and it’s also real easy to smoke a rack of ribs with. People have been doing it for ages. Many folk hold for some reason to the misguided belief that they need a fancy off set, or expensive water smoker to smoke ribs at home. Horse hockey! 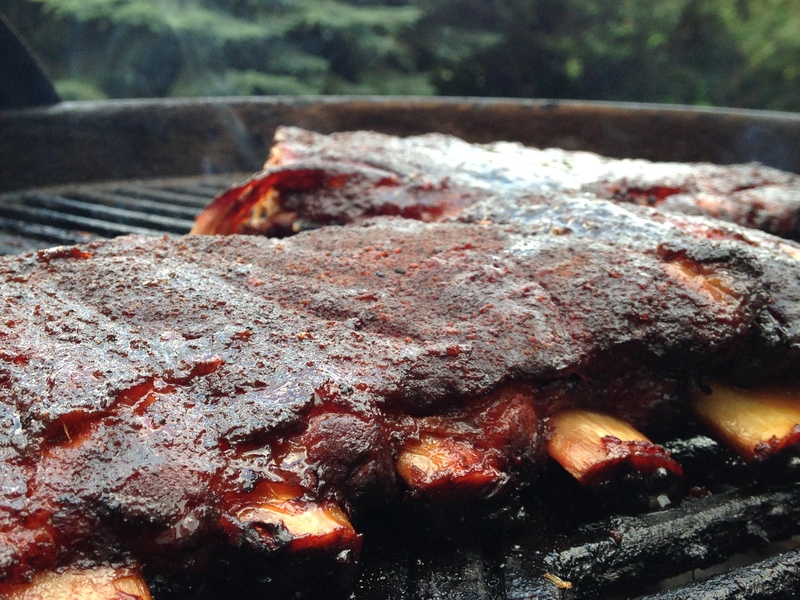 Here then is how to make restaurant quality smoked pork ribs on your old Weber kettle grill. And it’s as easy as taking out the trash! As seen in the photo above, we set up the grill for indirect cooking. 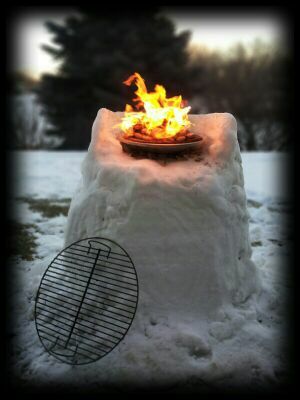 Light up about a half chimney of briquettes and deploy them equally on both sides of the pit. 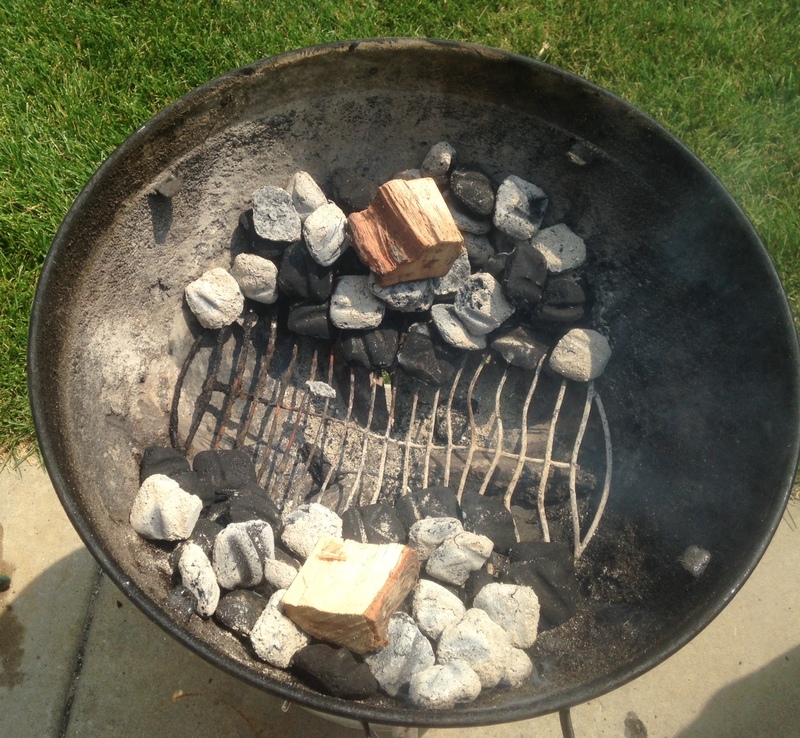 Then mix in a few unlit briquettes on each side as well. Two little minion fires of which to do your bidding. 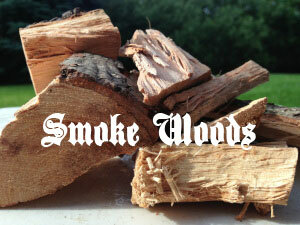 Lastly, add a chunk of your preferred smoke wood to each pile, and that’s all there is to it. We favored hickory today, the old pit master fall back and all-around great smoke wood. After removing the membrane on the back, the ribs were dusted liberally with the 14-Spice Dry Rub, and placed bone-side down, and centered in the grate. The damper on the bottom was adjusted to maybe 50%. The vent on top, open full. Plunk the lid on and let the Weber magic do it’s thing. The little pit came up to 250-something degrees and then stayed there, as the wonderful tendrils of hickory smoke curled into the air. Now when you put the lid on, be sure to position the top vent over the ribs, thus to draw the smoke where it ought to go, over your spoils. You can stick a thermometer in through the top vent if you want, and it should read somewhere around 250 -275, which is perfect. If it’s hotter than that, reach below and close off the damper there a little more. Close the top vent even, if necessary. The more you close the vents, the less oxygen runs through the pit, and thus the cooler it gets. Simple pit physics people. A pan of water placed between the coal beds can also act as a heat sink for you, helping to keep the pit temperature down. This old faithful kettle grill settled in at 250 however, with remarkable ease. And yours will too. All you have to do is ask nicely. Let the ribs and the pit do their thing now, for the next three hours. Your only job is to stay out of the way. This age-old discipline usually involves frequent sorties to the fridge where upon you may wish to draw a glass of something cold to drink. Then it is usually good form to go take up roost some place comfortable and while away the hours there, and enjoy the natural patterns of wood smoke curling against a beautiful, blue sky. If you’re in a rush, BBQ is probably not the thing for you. But if you are one with a proclivity for loitering, at ease with long, protracted hours of peace and tranquility patron to the pit, well then, you can go far in the smokey arts my friend. And rest assured that the path there smells amazing. After three hours, we foiled the ribs. Foiling the ribs isn’t necessary I suppose, but we like to do it that way. It almost guarantees a tender, succulent end game every time. The meat is steamed when in the foil, and let it be said, oh how it pampers it so. 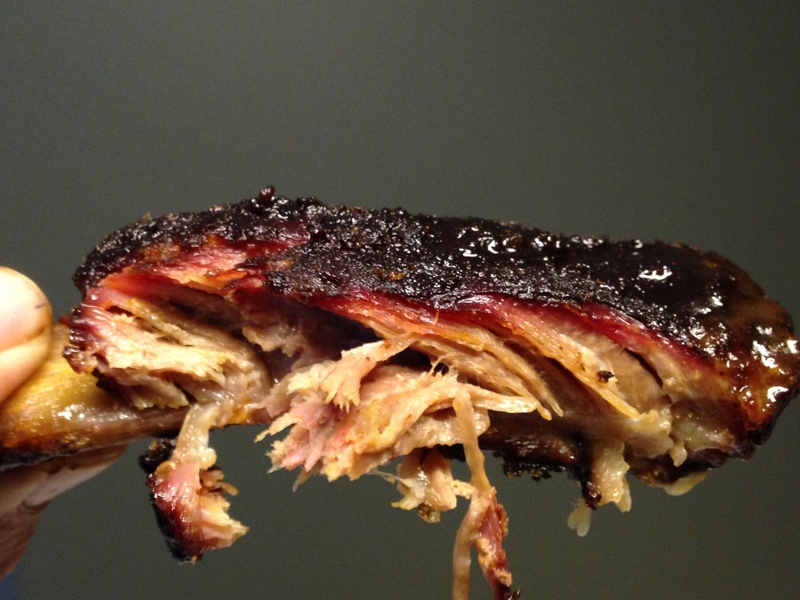 When you wrap the ribs, add some sort of steaming agent: BBQ sauce, honey, juice, cola, beer. What ever you like. Just a splash or two. This time around we foiled our ribs with butter and brown sugar, and boy let me tell you, that was a round trip ticket straight to my happy place! The butter and brown sugar marry together for a wonderful caramel effect, those flavors then merging with the dry rub and the wood smoke, mercy, the results are off-the-charts concerning pork ribs. Also at this time, add more unlit coals to the fire if you think you need it. 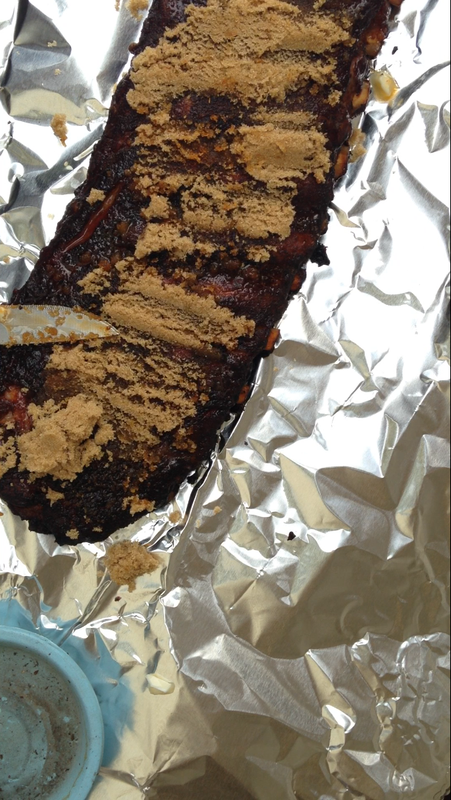 Anyways, let the ribs dot their thing in the foil now for an hour at least, maybe even two. Check in on them after the first hour, and if they bend easy, or a tooth pick passes through the meat with little resistance, they’re ready. If bones are falling out of your plunder like teeth from an old man, it’s passed ready, tho still delicious. But before you jump the BBQ gun here, and dive head first into your ribs with the reckless abandoned that grips you , take them out of the foil and put them pack on the pit for a while longer. This engagement in patience will first off tighten the meat mass back up a little, and lastly caramelize the butter/brown sugar glaze it has been foiled with the last hour or so. And when we say caramelize, we mean caramel! For what, after all, is caramel made from? Butter and brown sugar for starters. So mind the meat carefully over the coals for a few minutes at the end here, and watch that sweet pit master magic take your ribs to yet again the next level of yum! Man, can you smell it people! Let’s slice one off, shall we, and take a gander! Ps…No sauce necessary here! Please refrain from drooling on your keyboard, as it is very difficult to clean later. Hickory smoked pork ribs off the Weber kettle grill, seasoned with 14 -Spice Dry Rub, sided with cold noodle salad and a scoop of beans! Man! Good BBQ. Good times. This entry was posted on July 9, 2015 by Patrons of the Pit. It was filed under Uncategorized and was tagged with 14 Spice Dry Rub Mix, barbecue, bbq, cooking, food, foodie, grilling, pork ribs, Weber kettle, weber kettle grill, writing. As always, they serve up a good looking post. I can almost taste the food. I want the sides ALMOST as much as the BBQ. Another mouth watering post. As Yes, I am drooling, though not on my keyboard. Haha, good to hear! Thanks for the reblog too! Man, the ribs look rather tasty. I’m definitely going to try this. My better half and brood of misfits bought me a Weber 22 for Father’s Day. It now seems that I want to grill every meal. I’ve only used direct heat and have yet to add smoke, but I think that these ribs just might be my first attempt. Great post! I’ve been missing your wit for the past week. Very nice! Congrats on your bouncing baby Weber. A proud day in any man’s life! You will find it a versatile and dependable unit for years to come. I love them old kettle grills. Now you gotta get yourself a cast iron grate for it, and you’ll be all set! Good luck on your rib smoke. I believe in you, brother! You got this! One day maybe computer technology will develop a “taste chip”, and we can be almost no more! Or something like that. 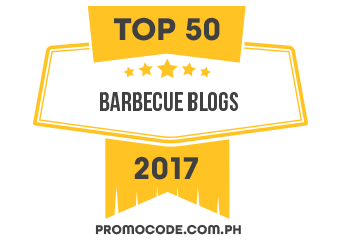 Thanks for chiming in! Ribs are like that. Thanks Mr Fitz! One of these days we’ll send you some REAL rub to try!!! That can be arranged ! Ok. I’m cooking ribs tomorrow. And I’m cooking jalapeño poppers with them. You talked me into it. Well it’s tomorrow now! Here’s hoping tomorrow’s yesterday was everything you dreamed it would be yesterday and today…. And no doubt you’re also sitting on the loo! How cow. I mean, Holy hawg! 🙂 Those are the prettiest ribs I’ve ever seen. Thanks TJ! Any hog smoked low and slow will win a beauty contest with the likes of you and me. Stay cool dude! I am so sorry, my friend. I am down in Florida now half way through our vacation. We had some pretty good brats on the fourth, but I would have loved to sample those ribs!!! Keep up the good work and we will be back home in Ecuador soon to rival your culinary creations. Very cool. Have a good trip, John and Mary! Blessings! Least you don’t lick your monitor. We got some folk who claim they do! That’s when you know you have a problem.